Taiwan has sworn in its first female president, Tsai Ing-wen of the Democratic People’s Party (DPP), after her party’s sweeping victory in the January elections. In her speech she called for “positive dialogue” with Beijing, and added that the Taiwanese people are "committed to the defence of our freedom and democracy”. This is not likely to be welcomed by Beijing, which claims Taiwan as a province of China and has recently stepped up pressure on the island state by orchestrating deportations to China of Taiwanese nationals. Tsai Ing-wen has been sworn in as the new president of Taiwan, becoming its first female leader and calling for "positive dialogue" with Beijing. Ms Tsai, seen as an unassuming but determined leader, led the Democratic Progressive Party (DPP) to a landslide win in elections in January. The DPP has traditionally leaned towards independence from China, which sees Taiwan as a breakaway province. In the past, it has threatened to take the island by force if necessary. It still has hundreds of missiles pointing towards the island. Ms Tsai, 59, swore the presidential oath in front of the national flag, before being presented with the official seal. She and outgoing President Ma Ying-jeou then came out to wave at the crowds watching on screens outside the presidential building. 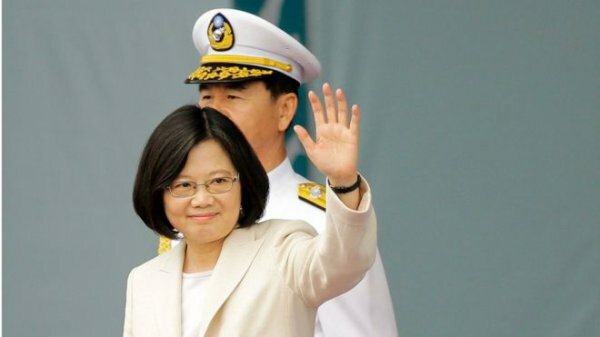 In her inaugural speech, she said Taiwanese people had shown they were "committed to the defence of our freedom and democracy as a way of life". The "stable and peaceful development of the cross-Strait relationship must be continuously promoted", she said, calling on both sides to "set aside the baggage of history, and engage in positive dialogue, for the benefit of the people on both sides". What Ms Tsai said in her speech is unlikely to satisfy Beijing. It sees eventual unification with the island as non-negotiable. With tensions rising in the South China Sea, Beijing is also keen for Taiwan to be its ally rather than be aligned with rival claimants to the disputed islets in the sea. What may also irk China is her focus on Taiwan's democracy and freedom - saying it's every Taiwanese person's responsibility to safeguard this. This is a clear message to Beijing that Taiwanese people cherish these characteristics of their society and their self-rule more than economic ties with China, even if the mainland is the island's biggest trade partner and export market. Democracy and freedom to Beijing mean pro-independence, so China will likely continue to distrust Ms Tsai. Ms Tsai's election win was only the second ever for the DPP - the Kuomintang (KMT) has been in power for most of the past 70 years. But Mr Ma lost public support over his handling of the economy, the widening wealth gap, as well as what many say was too friendly an approach to Beijing.